Also see our Facebook pages, YouTube video channel, Medium blog, Instagram and Flickr photo archive for more multimedia. Photo, video and multimedia use policy: All multimedia content owned or produced by Conservation Northwest (CNW), our Citizen Wildlife Monitoring Project (CWMP), and/or our staff or contractors working on assignment is the sole property of Conservation Northwest. All Rights Reserved. With the exception of CWMP partner organizations and agencies using our CWMP photos, written permission and photo, video or multimedia accreditation (Example: Photo: Conservation Northwest) is required for the use of our photos and multimedia. Please contact communications (at) conservationnw.org to request permission. Photo and multimedia content on this website and our social media channels that is not owned by Conservation Northwest is used with permission, as well as accreditation whenever possible. Yesterday, we released six fishers into North Cascades National Park with our partners from the Washington Department of Fish and Wildlife, National Park Service and the Calgary Zoo as part of an effort to restore the species to Washington State. This is the first release in the North Cascades. We’re so grateful to leaders, elders and youth from the Upper Skagit Tribe and Lummi Nation (shown in the video) for being a part of this special day. THANK YOU! We’re looking forward to working with our state, federal and tribal partners to monitor the success of Washington’s fishers. Learn more about this collaborative comeback story at: www.conservationnw.org/fishers-released-in-north-cascades. Do wildlife crossings work? Yes! Since they were completed, mule deer, coyotes and other species have been using the Gold Creek wildlife undercrossings to safely travel under I-90 in Washington’s Cascade Mountains. This compilation video from our partners at WSDOT shows a variety of species using these two wildlife undercrossings just east of Snoqulamie Pass over the last two years. Soon, two overcrossings or “wildlife bridges” east of Keechelus Lake and west of Easton will provide these animals a way to cross safely over the interstate. We have a plan to provide safe passage through wildlife crossings. You can keep both people and animals safe through a donation. Learn more and lend your support TODAY at: www.okanoganwildlifecrossing.org! More than 350 mule deer a year are hit by cars in one short section of Highway 97 in north-central Washington. Help us create safe passage for deer and other wildlife including endangered lynx by donating to our new Okanogan Wildlife Crossing Campaign. Get a bird’s-eye view of our new Sagelands Heritage Program! We’re working to maintain, restore and connect shrub-steppe landscapes from British Columbia’s Okanagan Valley to south-central Washington’s Horse Heaven Hills for the good of both wildlife and people. This Google Flyover will take you through our program area, stopping at locations that provide valuable habitat and need to be better connected for wildlife to move today, and into the future. On May 9, 2018, our partners at the Washington Department of Transportation (WSDOT) captured this awesome remote camera footage of elk using the Hyak Wildlife Undercrossing just east of Snoqualmie Pass. Have YOU seen elk or other wildlife alive or dead along I-90 between North Bend and Easton? Report sightings at: i90wildlifewatch.org/report-a-sighting. Info from motorists helps inform wildlife crossings and other conservation efforts in this corridor! Our job isn’t just to restore wildlife, we ensure habitat is protected and connected so that wolves, wolverines, mule deer and other species can be sustained across our region. Premiering at our 2018 Hope for a Wild Future Auction & Dinner, this short film looks at our successes connecting habitat through wildlife crossings under and over I-90 near Snoqualmie Pass, and how we’re applying similar strategies and collaborative expertise in new areas through our Sagelands Heritage Program and work for wildlife crossings in the Okanogan Valley. By partnering with local communities and bringing people together, we’re keeping the Northwest wild acre by acre, underpass by overpass, from the mountain wildlands to the arid sagelands. But this work is only possible through the support of our conservation community. If you weren’t able to join us at our auction this year, please consider joining or renewing your membership through a gift of $35 or more at www.donatecnw.org. Your support is keeping the wild Northwest connected! Released in January 2018, Cascade Crossroads is a 30-minute documentary film chronicling the story unfolding over and under Interstate 90 just east of Snoqualmie Pass in Washington’s Cascade Mountains. Here at the intersection of an east-west transportation corridor and a north-south wildlife migration corridor, a monumental project combining conservation, collaboration, and innovation led to the construction of North America’s largest wildlife crossings project in conjunction with major infrastructure improvements for motorists. The I-90 Snoqualmie Pass East Project, and the wildlife crossings and roadway improvements within it, is a win-win for people and animals that offers a new model for major infrastructure projects bisecting wild places. Commissioned by the I-90 Wildlife Bridges Coalition, the Cascade Crossroads film aims to not only share this unique story but also inspire action in other landscapes facing similar tensions between wildlife and roadways. Conservation Northwest​ is the administering organization and fiscal sponsor for this coalition. Prepared for the Cascadia Partner Forum’s 2017 WildLinks meeting, this video features the voices of climate leaders from throughout the Cascadia landscape speaking directly to those working on the ground to manage, monitor, and conserve natural resources in this region. Each of them defines what a resilient Cascadia means to them, what threats they see to a resilient future, why it is important for us to come together, and specifically what they’d like to say to those working on the ground today. Animals big and small travel through the Interstate 90 corridor around Snoqualmie Pass—from elk and mule deer migrating between their summer and winter ranges, to black bears, bobcats, and even wolves and wolverines searching for food, mates and new territories to call home. Have you seen wildlife along I-90 between North Bend and Easton? Be sure to report it at i90wildlifewatch.org/report-a-sighting! Thanks to the support of our members, we’re restoring fishers to Washington. But keeping the Northwest wild is about so much more than just one species. Will you help protect our natural heritage and ensure a wild future by becoming a Conservation Northwest member at: www.conservationnw.org/join-us? Our M.O. is simple: connect the big landscapes, protect the most vulnerable wildlife, and conserve our natural heritage for future generations. But we can’t do it without your support! Now is the time to restore the North Cascades grizzly bear! The North Cascades Ecosystem is home to the only remaining grizzly bear population on the West Coast of the contiguous United States. Although grizzlies have lived in the North Cascades for thousands of years, biologists estimate that fewer than ten remain today, making it the most at-risk bear population in North America. After decades of research, the National Park Service, U.S. Fish and Wildlife Service and other agencies have released proposals to support the recovery of this iconic species. This is welcome news, and a historic conservation opportunity. But just how do we restore these magnificent animals? Follow the story of grizzly bear recovery in Montana’s Cabinet Mountains, through the lens of ecologist and bear expert Chris Morgan. Grizzly recovery in the Cabinet Mountains, done through science and community involvement, could serve as a model for the North Cascades. A Chris Morgan Wildlife / Wildlife Media Production. Made possible through the support of the National Parks Conservation Association, The Cutler Foundation, Conservation Northwest, Vital Ground, Fox-Dobbs Family Trust, Temper of the Times Foundation Inc., BearTrek, Woodland Park Zoo, Icicle Fund, the Mountaineers Foundation, and Joe Scott & Tanja Wilcox. More information at https://www.timeforthegrizzly.com/. Fishers have returned to Mount Rainier after being lost to over-trapping and habitat loss almost a century ago! Learn more about our collaborative reintroduction project with the National Park Service, Washington Department of Fish & Wildlife, and other partners at: www.conservationnw.org/fishers. Video: Ted Grudowski December 2, 2016 at Mount Rainier National Park. We’re excited to share a brand new trailer for a film that will tell the story of the monumental wildlife crossings now being built under and over Interstate 90 east of Snoqualmie Pass! Cascade Crossroads is a film project of the I-90 Wildlife Bridges Coalition, a collaborative group of conservation, recreation, tribal, business and community organizations administered by Conservation Northwest. Thanks to the organizations and individuals who contributed video, photos and content to this trailer: Conservation Northwest, Washington State Department of Transportation, Washington Department of Fish and Wildlife, Forterra, The Nature Conservancy, Ben Hammond with Lighthawk, Chase Gunnell, John Marshall, Steve Gnam, and Sean Frego. Many organizations and individuals have made the story that is unfolding in the I-90 corridor of Washington state possible. We look forward to recognizing them in the feature documentary. Trailer created by Ted Grudowski, Kris Browne, and Sandy Asher. For 27 years we’ve worked to protect, connect and restore wildlife and wildlands in Washington and British Columbia. We’ve won protections for millions of acres of wildlife habitat, reintroduced endangered species and advanced coexistence with iconic carnivores, and reconnected fragmented landscapes for wildlife including lynx, caribou, elk, wolves, wolverines and grizzly bears. Using conservation biology, a collaborative approach, and staff living and working on the ground across our region, we’re keeping the Northwest wild for future generations. This short film premiered at our April 2016 Hope for a Wild Future auction and dinner. Produced by Ted Grudowski and Chase Gunnell. Special thanks to Dr. Gordon H. Orians, Doug MacDonald, Mitch Friedman, Jeff Baierlein and Jen Watkins. Additional footage by Paul Bannick, Alaina Kowitz, Story Warren, Eric Zamora, Lena Jackson, Sean Frego, Chase Gunnell, Eric Snider, Jeremy Williams, Western Wildlife Outreach, WDFW, WSDOT and ODFW. America’s public lands not only give us cherished outdoor recreation opportunities and protect our fish, wildlife and natural heritage; they also provide strong economic benefits for local communities. Yet our public lands are under threat by powerful special interests who want to seize or steal them for profit. If we want to keep our public lands in public hands, we must raise our voices and ensure that elected leaders defend and preserve them. The Coast to Cascade Grizzly Bear Initiative is a coalition united to save southwest British Columbia’s grizzly bears. Conservation Northwest serves as the administering organization for this collaborative effort. Find out more about the threatened grizzly bears of southwest BC, the challenges they face and our collective hopes for preventing their decline towards extirpation (local extinction). www.coasttocascades.org Video by Jeremy Williams / River Voices Productions. Fishers are back in Washington’s Cascade Mountains for the first time in over 70 years! Seven fishers were reintroduced near Mount Rainier on December 3rd, 2015. The release of seven fishers is just the start of an effort to rebuild populations by moving as many as 80 fishers within the next two to three years to the Gifford Pinchot National Forest and Mount Rainier National Park. The releases will occur on the Gifford Pinchot National Forest and in Mount Rainier National Park. Two to three years later, releases are planned to follow in the North Cascades in the North Cascades National Park Service Complex and in the Mount Baker-Snoqualmie National Forest. For Chief Ian Campbell of the Squamish Nation, protecting, connecting and restoring grizzly bear populations is part of our responsibility to future generations. The Coast to Cascades Grizzly Bear Initiative is a collaborative effort to stem the ongoing loss of grizzly bear range and promote grizzly bear recovery in the transboundary ecosystems of southwest British Columbia and northwest Washington state. If the youth leaders of tomorrow’s conservation movement could tell natural resource practitioners, wildlife and wildlands agencies, and non-profit organizations one thing, what would it be? To kick off the 2015 WildLinks Conference we decided to find out! Working with students from the Doris Duke Conservation Scholars Program at University of… as well as attendees of the North Cascades Institute ‘s Environmental Learning Center, we interviewed over a dozen young people about what they thought was important for a wild and healthy future in our region. This video is a sampling of what they had to say. Led by the Cascadia Partner Forum and Conservation Northwest, WildLinks is our annual conference and science briefing that brings together researchers, conservationists, land managers, agency officials, tribal and First Nations leaders and other experts from Washington and British Columbia. The goal is to share ideas and better coordinate keeping our region’s wildlands and wildlife populations healthy and connected. The 2015 WildLinks Conference is hosted by the Cascadia Partner Forum and sponsored by Conservation Northwest , the Skagit Environmental Endowment Commission , Washington Department of Fish & Wildlife , North Pacific Landscape Conservation Cooperative and the Great Northern Landscape Conservation Cooperative. Learn more here. The landscape in Washington’s central Cascades, spanning Snoqualmie Pass and bisected by Interstate 90, forms an important travel corridor for people, goods and wildlife. Since 2000, through The Cascades Conservation Partnership and the I-90 Wildlife Bridges Coalition, we’ve led efforts to reconnect Washington’s north and south Cascades by protecting and restoring habitat and establishing safe wildlife crossings under and over I-90. Video produced by Ted Grudowski. Originally produced in 2004 by Conservation Northwest (then the Northwest Ecosystem Alliance) Chris Morgan (Insight Wildlife Management), Vidcom Productions and John Cofrin, we’ve updated this 30 minute documentary-style film for 2015 and the announcement of a long-awaited North Cascades grizzly bear restoration EIS! Produced by Conservation Northwest for WildLinks 2014 and the Cascadia Partner Forum, this short video dives into the role of grizzly bears as an important umbrella species for wildlife and wild lands across the Northwest, from B.C. into Washington’s North Cascades. Restoring these Northwest natives, now absent from much of their historic range, provides a powerful tool for collaboration, coexistence and region-wide conservation. When it comes to documenting the presence of wildlife in our region, our Citizen Wildlife Monitoring Project staff and volunteers are on the front lines; tracking wildlife where state and federal agencies don’t have the resources to go, from the Washington Cascades to the Kettle Crest to British Columbia. Video produced by Ted Grudowski. Chief Michelle Edwards of the Cayoose Creek Band, St’at’imc Nation, talks about what grizzly bears mean for her people, and how First Nations are working to restore these iconic animals in British Columbia and the greater Pacific Northwest. Learn more at www.coasttocascades.org. Our spring-fall 2014 volunteer wildlife monitoring season has come to a close! See highlights and some of the best animal photos from this past season in this new video produced by our monitoring team. On October 29, 2014, some of the leading experts on wolf ecology and management came together at the University of Washington to present current science on the different impacts that lethal management may have on wolf ecology, pack structure, habitat connectivity, social acceptance, and recovery and to discuss how to apply this knowledge to wildlife management in the Pacific Northwest. We came back from a range riding trip in Eastern Washington with this neat video of using howls as a tool to locate a wolf pack, and make sure they were separated from the rancher’s livestock. 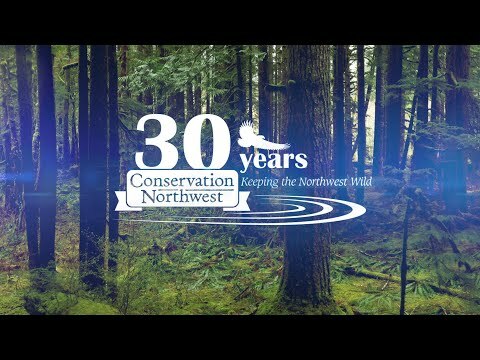 Conservation Northwest celebrates 25 years! This video, produced by Ted Grudowski, was created for our 2014 Hope for a Wild Future auction. It takes us back to the early days of Conservation Northwest and celebrates 25 years of success. A wolverine attacking one of our Citizen Wildlife Monitoring Program trail cameras in the Chiwaukum Mountains west of Leavenworth! Highlights from Conservation Northwest’s Cascades Citizen Wildlife Monitoring Project. Remote cameras were installed and maintained by volunteers in Washington’s Cascade Mountains and British Columbia’s Rossland Range during the 2013 season. You can volunteer or sponsor a camera team here!